hi i have trouble setting up this combo. is the sb500 compatible with the v5 wireless flash transceiver? what do i have to do to make it work? i get two green light when taking a picture but the flash doesn't start from any distance. Set your SB-500 to M mode and try again. hi, thanks for the reply. i tried to but when i detach it from the camera it goes automatically in ttl and i have no idea how to set it manually off the camera. do you know how to do that ? 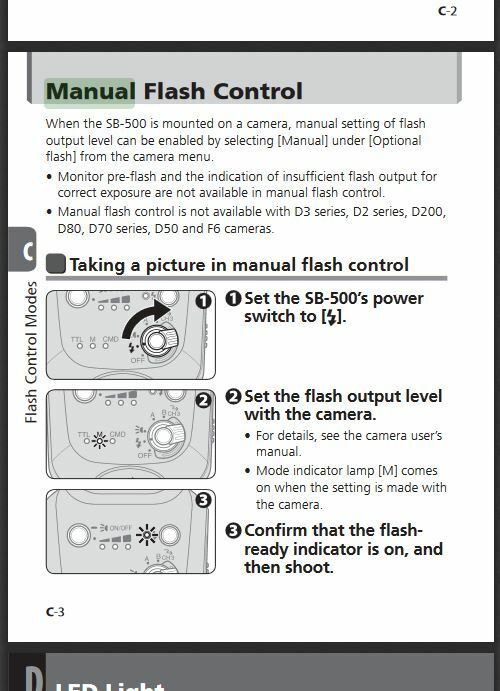 Turn to Page C-3 of your Nikon SB-500 user manual - screen captured for your easy reference.